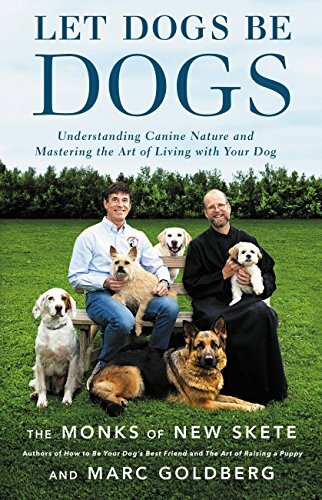 Let Dogs Be Dogs: Understanding Canine Nature and Mastering the Art of Living with Your Dog by The Monks of New Skete and Marc Goldberg. The primary premise of the books is that dogs can’t be happy without a pack leader, and that had better be you. It thus seems appropriate to begin this review with a definition. LEADER: 1. One that leads or guides. 2. One who is in charge or command of others. 3a. One who heads a political party. 3b. One who has influence or power. 4a. A conductor. 4b. The principal performer in an orchestral section. 5. The foremost animal, such as horse or dog… 12. The growing apex or main shoot of a shrub or tree. 13. An economic indicator. Abridged from The American Heritage Dictionary of the English Language, 4th edition. As is clear, the word leader has many meanings. Many of them are positive, such as someone who leads you out of danger, or the leader of the girl scout troop. When I grew up, leaders were people you looked up to, and perhaps aspired to be yourself someday. However, the word leader has become a symbol of so much more in the training world, and not necessarily in a good way. It might be, in fact, the perfect symbol of a perspective seemingly 180 degrees away from positive reinforcement-based dog training. Think Cesar Milan versus Dr. Susan Friedman. What strikes me most about this book is how out of date it feels. I don’t see the term “drive’ used very much anymore, because when it’s used to describe motivation it is intuitively obvious: “The rat has a strong drive to find food because it is very hungry.” I presume the authors use “pack drive” to mean a motivation to be part of a group with a clear leader, because they talk about being your dog’s leader on almost every page. The authors briefly mention that there are several theories about the evolution of dogs, but never mention the research that shows social behavior is in large part driven by resource distribution in feral dogs as much as anything else (as is true in many species). Neither have I found a discussion about the vast scientific body on learning and training, nor any of the research that shows that physical corrections can be harmful to our relationship. According to Brother Christopher and Goldberg, one achieves leadership in part by using leash pops, which are meticulously defined: “A quick in and out motion with the left hand on the leash that is reminiscent of the way one snaps a towel at someone at the local pool. Its purpose is less punitive than attention-getting.” No mention is made of the fact that many classes teach attention as an exercise. Along with a “strong verbal no,” leash pops are advised for a dog who failed to sit on command, while an abrupt about-turn, “redirects the dog’s focus on you as you walk in the other direction.” Well, yes it does. It focuses on you because if she doesn’t, she’s going to get hurt. Every step forward in progressive dog training seems to be followed by one or two steps back, and this book boldly marches backward. Dog owners who know nothing of progressive dog training and the science behind learning are going to snap this up like dogs on a doughnut. I’ll bet that that this book is going to be all over bookstores. It’s already #1 on Amazon in Dog Training. The Monks first book, How to Be Your Dog’s Best Friend, published in 1978, is STILL the book I often see turned cover-side up at bookstores, which is astounding given how long ago it was written. Confession: When I first started reading about dogs I loved How to be Your Dog’s Best Friend. Just about everyone did, because it felt like a balm of benevolence compared to what else was out there. (For example, Kohler–“fill a hole full of water and hold your dog’s head in it to stop him from digging”.) I even titled my no-longer published booklet with a reference to leadership: “How to Be Leader of the Pack and Have Your Dog Love You For It.” It was written, ironically, to counter the harsh methods of people like Kohler, but I took it off the market because the whole “leader of the pack” concept was outdated and regularly misused. The Monk’s first book came out 39 years ago and at the time it felt revolutionary But that was then, this is now. Compared to the resources now available to dog owners, this book doesn’t feel benevolent, it just feels sad. But there’s another disappointment here. This kind of thinking pollutes the concept of leadership, in its best iteration. Dogs do need to know that we have their backs, that they can count on us when they need protection. Dogs do look to us–to protect them, to feed and water them and to provide nurturing and social acceptance. One can indeed argue that dogs are attracted to people that some would call “natural leaders” in the best sense of the word. However, (and I want to say this in capital letters, but would rather not yell), this has nothing to do with leash pops or “strong verbal no’s”. It has everything to do with being around someone who is comfortable in his or her own skin. Don’t you know someone who dogs love to be around? I’ve found that those people are not people who fuss over dogs, but who have a presence about them that everyone can sense. Everyone wants to be around people with this kind of presence, people and dogs alike. They come into a room and everyone looks at them. People want to stand beside them. I’ve known a few of them, some dog trainers, some not. What sets them apart is their sense of comfort in being who they are, that in some unquantifiable way, they are rock solid. Like the earth. The military veterans I’ve talked to told me that this is the kind of person who they see as a natural leader, and who they would follow into hell and back for. Perhaps this is what “The Monks” also see, and are trying to teach people how to find. However, I would argue that they suggest you try to get it in all the wrong ways– using physical force and by taking away your dog’s autonomy. We are advised to put our dogs on leashes throughout the day so that they get up when we get up, and are forced to go where we go. The monastery dogs are expected to be on a Down Stay during dinner and while their owners are working. If we treat our dogs this way, they guarantee they will be calmer and more obedient. Well, yes, there is some truth to that. Maggie was spayed two weeks ago, and for a week afterward she was on a leash, a Down Stay or in her crate. Rather than being buzzed up from lack of exercise, she became very quiet. No doubt many people would remark how calm and well behaved she appeared. I’d argue she was resigned, if not unhappy. As she gradually got more autonomy last week, she became more animated, with a sparkle in her eyes and an open, relaxed face. Guess which dog I’d rather have. I have no doubt that the authors of this book love their dogs, but this is a road I hope few decide to follow. Join me in helping to counter such old fashioned ideas by recommending all the great books, videos and website-based programs that teach progressive training perspectives. If you need direction, you could go to the Learning Center’s book reviews, or go to Dogwise for the dozens if not hundreds of books that employ truly benevolent and effective training methods that are not based on control, hierarchy and physical punishment. Or take Dr. Susan Friedman’s class, or watch videos from Dr. Sophia Yin or check out the Fenzi Dog Sports Academy or read The Classics or, or, or… The options are endless. Just take the road that should be most traveled, our dogs will thank us for it. MEANWHILE, back on the farm: Hot, hot, hot. And dry, dry, dry. It’s been a quiet time for the dogs, given Maggie’s need to recover from surgery and the hot, dry weather. Here’s a creature in the photo below who knows how to take care of himself. 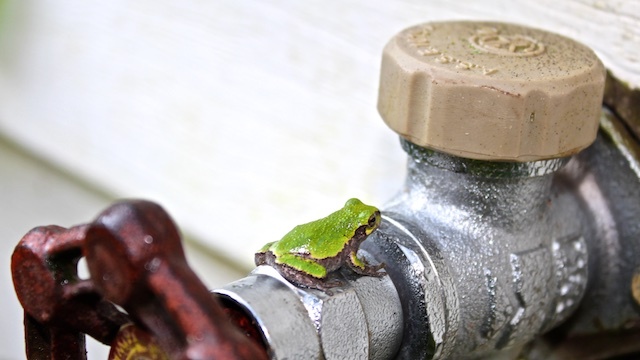 This tiny tree frog is always close to the outdoor faucet I use to water the plants. Clearly he’s found a moist, cool place to hang out. There are three places now in the garden where I routinely see tree frogs. I expect they each have they mini-territory and stay in one place most of the time. We are becoming buddies. Well, at least I adore them. No word about their feelings toward me yet. 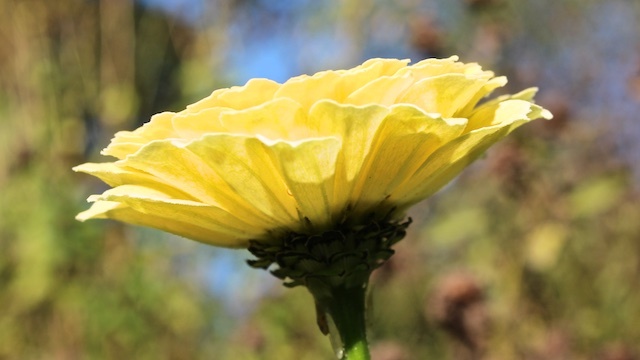 Lots of the plants and flowers in the garden look just awful at the moment. I’ll spare you the photographs of them. (Although, someday I should just post photographs of the myriad plant diseases that my garden attracts; I have a veritable petri dish of molds, rusts, and heaven knows what else.). 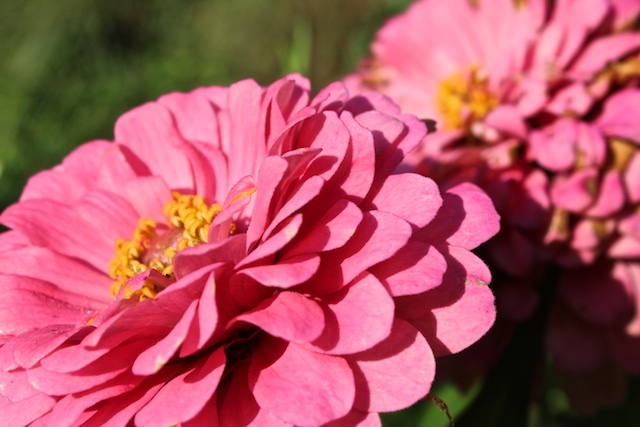 But zinnias love this time of year; Yay annuals! What’s beautiful in your life right now? One of the first books I read after becoming interested in canine communication, training, etc was the Monks “How to be your dogs best friend”…alas only 10 years or so ago. I downloaded it on my Kindle……luckily the batteries were never replaced after they went dead at least 3 years ago! What’s beautiful in my life right now is my 12.5 year old dog who came back from the groomer looking debonair. He still has it! Is it a dogwhistle when a dog-training book warns us against “political correctness”? I loved their books 20+ years ago, when I first found them, but no more. It’s discouraging to realize that while I have moved on & found new ways to relate to & train my dog, they have not. It’s even more discouraging to realize how many people are still prepared to pay good money for bad advice. And don’t underestimate how prevalent (and pernicious) it is. I was walking Nina at a park yesterday when a total stranger reproached me for letting her walk in front of me. (For the record, our criteria for walks are: maintain slack in the leash, & maintain enough distance that I can take a normal stride. Beyond that, do whatever you like.) It was not my finest hour. I snarked back that MY dog has a CDX, & I was quite satisfied with her, thankyouverymuch. Self-righteousness=missed opportunity/teachable moment. Oops. And a question to the community–what to do with dog-training books with philosophies & methodologies you no longer agree with? I donate all the books I’m done with to BetterWorldBooks (great organization), & I am very uncomfortable with the idea of censorship, but I don’t want to encourage people to read this dreck & try it at home. Thoughts, anyone? The “Monks of New Skete” have also been advertising a shock collar (euphemistically described as an “e-collar”) workshop that they describe as “force-free” — maybe because you are not actually hitting or alpha rolling the dog? But that goes hand in hand with their dystopian view of dogs and dog training (great phrase, Tricia!). I am not at all surprised by the ideas in the new book — my real disappointment is in those that follow its advice. First let me say, love your posts, I do NOT agree with the monks or Cesar. I have two dogs, McGee, a border collie mix, a rescue and a therapy dog. He literally seems to understand what I wanted immediately when we started training. He is calm, mostly, and super obedient. My other dog is Sadie Jayne, also a rescue. She and her litter mates were found dumped on the side of the road at about 3 to 4 weeks old. Luckily they were taken to a rescue person. Sadly Sadie was not socialized in her early months, I rescued her at 5 months old. As a result she has some fear issues. We started school at around 6 or 7 months and still continue, she is 4 now. She does not like people, no growling or biting, just she’s away. It took her over a year to go to my trainer and a few other people in class. She loves other dogs! And seems more comfortable around kids, not adults. Progress has been incredibly slow, but there has been progress, I guess we will just keep plugging along. Tho my trainer has mentioned Pops to some others, she feels Sadie would not benefit from it, I won’t do it anyway. Sadie isn’t terribly food oriented so praise it is. And I fully praise and talk to my dogs all the time. The border responds immediately, Sadie so so, as her attention can be misdirected if anyone is walking behind us or too close. After training McGee, she has been a workout, but she keeps me on my toes. They are the loves of my life! Margaret, I have thrown away (recycled…) all my dog training books with approaches I no longer agree with. It’s sort of satisfying to do that! How to Be Your Dog’s Best Friend was one of the first training books I bought, way back when I started accumulating dogs, after I moved to the country. Oh dear, I still feel so bad about one particular incident, involving my neighbour’s dog who I looked after sometimes. Normally he was pretty well-behaved, but one day he started acting strange and kept grabbing my arm and pulling on it, and I was super busy that day and lost patience and did that “throw down on the back” thing I seem to remember the monks recommended. This was very stupid (he could have bitten me, but being a sweetie he didn’t, he just looked sad and confused, like “I thought you were my friend…”) and very mean of course. AND it turned out later that day that he was trying to get me to go to his owner’s house because the fellow had had a breakdown and was in very bad shape. Finally, after the dog started running back and forth between the two properties, over and over, the dumb human, that’s me, finally figured out that I should listen to what the poor dog was trying to tell me. Things turned out ok; the dog stayed with us while the owner went to the hospital, and eventually the dog and owner were reunited at home. Thank Heavens as time went on I learned more and read more, and became a better dog person! My sister is a natural dog (and all animals, and people!) person. It’s so funny…she isn’t involved with animals in any particular way, but I have never seen an animal that didn’t adore her! She greets any and all as though they were long lost friends… it’s wonderful. Patricia, your little frog is beautiful! And the flowers…yes, yay annuals at this time of year…and sedum (SP?)! Lots of people cling to their beliefs, even when science marches on and proves them wrong. Monks and dog trainers are no exception. Sad. I had that New Skete book 20+years ago with my first dog … their “theory” never sat right with me, even then, even though the hottest thing on TV was Matthew ‘Uncle Matty’ Margolis leash-popping dogs everywhere. I don’t think he advocates that anymore, actually. I’d just throw those books away. Imagine they were books about another outdated, incorrect theory, such as eugenics. Surely you wouldn’t want someone else to be reading them? I loved the Monks’ books back when they first came out too. How to be Your Dog’s Best Friend and the Art of Raising a Puppy are both still on my bookshelf, but only for historical reference now. I recently did a major clean out and donated a lot of books, but purposely did not give those away because I didn’t want to put that kind advice out into circulation. I’m uncomfortable with anything resembling censorship too, but decided it was fine to manage my own part in the flow of ideas according to my principles. FWIW. I wasn’t familiar with Dr. Friedman but thanks to this blog post I’ve looked her up and may audit her course next time it comes around. I actually did my grad work at USU (many many years ago!) in animal behavior, but in the wildlife dept – so the focus was behavioral ecology. Kind of wish I’d been aware of the emerging applied animal behavior field back then. My career path may have been different. Anyway, thank you Dr. McConnell for dropping more names and ideas for me to follow up on! The comment in the book about seeing eye dogs was odd. Of course, when they are working, they are not being “showered” with affection, but I’m sure it’s a different story when “off duty”. Also, working dogs are not perfect little robots! I know of one seeing eye dog who would grab up a treat from the grocery store everytime his owner shopped there. His owner wasn’t aware that the dog was doing this for a long time, and the clerks just thought it was amusing. My aunt had a border collie who would occasionally take vacations by hiding for a day. Guess these dogs just needed stricter bosses…. “this book boldly marches backward” – love it! I have many books on living with and training dogs but the one I love best is “Plenty in Life Is Free: Reflections on Dogs, Training and Finding Grace” by Kathy Sado. Sorry you have to keep fighting this fight, Trisha, but I’ve very glad you are. Your grounded, nuanced perspective brings in an audience that may otherwise be unreachable. For me, harsh treatment of dogs “for their own good” is just another manifestation of a weird, sad sort of “adultism” that assumes that the toughest “love” is always the most effective love, and it just isn’t true. It’s an inherited perspective that those of us who want to help young people have to constantly be aware of, because early exposure can create some pretty sad cycles of suffering. Love your frog – they are such fun! Oh – and what’s beautiful in my life right now are the monarch butterflies visiting our buddleia! When Maddie was in her cart in the final stages of DM, she would sometimes stop and not want to move forward. If it was early in the walk and she just looked distracted, I’d cheer and clap and maybe even rattle the treat bag. But if it was near the end of the walk and we’d gone just a bit too far and she was flagging, we would sing to her. And she would rally herself and soldier on, ears sideways, because we sang and it made her want to try. I wonder what the Monks would make of that in light of their view of leadership? ” How to be Your Dog’s Best Friend” was also one of my first dog books – in 1986. We had got our first dog and she was a wild child. Literally – as far as anyone knew she had been born in the woods and stayed there until some humans took her in at 4 months. I got her at 5 months and was soon beside myself. I was certain that at least she was “hyperactive.” She was a classic “American Hybrid” and my best guesses on her breed influences were Husky and Basenji. No question she was a strongly committed and too often successful escapist. Once I read the monks I used the alpha roll and isolation to combat that. It wasn’t successful. Thank God I quickly realized I was punishing her for returning home. I’ll never forget the look of betrayal in her eyes the last time I rolled her. The memory still makes my stomach hurt and brings me to the verge of tears. Spot died in 2002 at the age of 16. She wasn’t escaping as much but gave it one final shot just a couple of months before she died. When Spot and I went to our first training class, I could barely restrain her on the leash. She was excited by all the other dogs and pulled and strained to get at them. I went home with blisters on my palms. (No more thick, nylon leashes for me.) I told the instructor I wanted us to just watch the first session (of 10 classes!) to give Spot a chance to get used to being around dogs. She said, “Nope,” and between us we got Spot under control in the first class. She used leash popping and a Volhard collar very effectively. I’m convinced that the problem is less with the technique than with the impossibility of the vast majority of trainers and especially owners learning how to do it right. I didn’t keep using it, I include myself in that vast majority. That said, I loved all of Vicki Hearne’s books – she was a devoted Kohler trainer. She had some of the best insight into dog behavior I’ve ever read though I didn’t use her techniques. I believe her explanations of them helped me to understand dogs better. Having seen the first trainer use the snap – NO jerking or dragging or choking – on Spot I understood how it can be not at all cruel – any more than it was cruel when my Standard Poodle seriously “alpha rolled” one of his friends when she threatened another, closer puppy friend. Dogs understand cruelty differently than we do. I’m not a dog so I don’t do the same things they do. If I used a leash pop on my Cavalier, I’d scar her for life! I am glad you posted this review; yes, the methods are vastly outdated, and are even dangerous for first-time pet owners. What struck me is the popping a towel at the pool metaphor. The attaining of attention by such a tactic is simple bullying. A person snaps a towel, and the person on the receiving end has no clue as to what sparked the behavior, how to avoid it, or what to do so as not to receive it. Dogs and people alike will then use avoidance methods, up to and including the shut-down. Thanks again for all you do, Trisha. The saddest thing is that the Kohler method was what was used for our family dog in the 1970’s–and I recall the trainer hanging a terrier until it was comatose. I had no idea just how cruel it was–it was my only exposure to dog training. My first dog, a shepherd rescue in the 1970’s was such a fantastic dog, and yet I put the piece of couch in her mouth, because it was all I knew. Luckily, it disgusted me and we had 12 tremendous years with her. Thank you for this honest review, and it still shames me that we thought the Kohler method, which literally told you to beat the dog, return and beat it again, had any validity. My current dog is a 13.5 aussie/shepherd mix who has worked hard on overcoming her fears and is a joy. And we turned to Ian Dunbar and your books. It’s sad, but not surprising, that people are still making money off this outdated methodology. I had a run in with a trainer once, don’t know that I handled it as well as I would’ve liked. I didn’t yell, but don’t know that I educated either. She was getting on me for my dog’s isolation distress which my mother mentioned in passing (she whines when I’m in the bathroom). Apperantly my problem is that I baby her because at that particular moment I was carrying her. Even though she doesn’t like being picked up at home, and an observation of a couple of minuntes it enough to tell what goes on all the time. It would never occour to the woman that maybe the isolation distress and being carried from that moment could stem from fear or different fears. Chloe, my dog, was scared being on the ground in a crowded building (if I was a toy breed of dog I’d be scared too). I was scared for her safety as well and mentioned this. The trainer assured me that she would be fine on the ground and was disbelieving when I told her about the dog we saw at the vet who had a cast all the way up to it’s shoulder from a break it got from someone taking a step back and tripping over it. But apperantly dogs can’t be happy, well balanced, or well behaved unless they are in constant heel when out. What nonesene! I’d much rather pick up a dog for it’s safety (or comfort, if frightened) then risk an injury from a human, an injury from another dog, fear bite, or negative experience. I want my dog to enjoy going out and know that if things get scary I’ll protect her and not force her in a situation that is too much for her. So sometimes she walks, sometimes she’s carried, and some times she’s in her stroller (she gets heavy and hot to carry). She has gotten so much better about going out, no longer shakes in fear, and has made huge steps getting over her shyness. Ugh, those books remind me in the worst possible way of my first puppy in the early 90’s, and the “alpha rollovers” I did to snap her into top form (like a 4-month old puppy needs to perform like a recruit in Army basic training). I still remember doing it around a group of friends, huddled on the floor over poor Abby, growling at her because that would teach her who was boss. I glanced up to see looks of shock and horror on my friends’ faces. “Don’t worry,” I said, “this is how you train dogs.” I should instead have paid attention to their reactions. Anybody who is paying attention, trainer or not, can see that flipping a puppy on her back and snarling at her is just plain sick. Regrets, regrets. Terrific review! I am happy to see your list of alternatives to this out of date method of training. My mastiff puppy, Junior, and I start two classes with Fenzi Dog Sports next week. We are so excited!! I read Andy’s post above and think this sums up beautifully the problem/bias we seem to exhibit as a species. It’s why we also elect people to power who are potentially harmful and dangerous. I wonder if some of us think that being tough and able to lead and be protective has to equal being demonstrably harsh and forceful? What is beautiful in my life right now is early autumn walks in the woods with my girl. We are both getting a little stiffer and can’t seem to do much after a couple of hours hiking these days but still something we both seem to love in equal measure. I am so pleased you published a ‘negative’ review. Too often if we think something is wrong, we close our mouths and hope no one is offended. Give me good, honest information with factual support and I will follow you anywhere! Keep up the good work and publishing excellent information. Thank you. I’ve loved your books, research,and wisdom,through the years. Your words taught me about how dogs can be studied (and I went on to study them for my thesis). Now I work as a professional dog trainer. I know you received a lot of backlash for posting this review but I hear what you are saying. Thank you. Be a selective sifter. If, as predicted, this book sells well, I’ll have to read it so that I can point out the good bits. The rest will fall by the wayside. 1. Guide dogs are their role model for happy, well-trained dogs. Are they aware that most guide dog organizations are transitioning over to clicker training? 3. Most of the original Monks of New Skete book was written by Job Michael Evans. He later left the order and became a professional dog trainer. In the late 1980s, he expressed regret for including some of the most punitive techniques. 4. I have firsthand knowledge of one case where the “alpha roll” killed a puppy. No, not directly. A big-name traditional training facility in my area instructed owners of a mouthy baby Husky puppy to alpha roll him each time he mouthed. By the time he was brought to us for a second opinion, he had become a panicked piranha anytime a human came near him, snapping wildly and rapidly at anything and everything. (Wouldn’t you, if you thought you were about to be assaulted/killed?) Amazingly, by the end of the day at our puppy daycare/training facility, he had mostly recovered to almost normal puppy behavior. (Such resilience! Though far from cured.) The girlfriend was convinced. Sadly, she was unable to convert her boyfriend (whom we did not get to talk to directly). He continued to bully the puppy in the name of “training,” until it finally retaliated/defended itself sufficiently to be euthanized. The pup wasn’t even 4 months old. That was 25 years ago, and I’m still not over it. 5. Positive training is not only kinder, it is more effective. Even when training “macho” things like police work (look up the good stuff Steve White has done). Thank you for your comments (and support). As expected, I have gotten some blow back (mostly on Facebook), but I’m getting less risk aversive in my dotage. If we don’t stand up against these sadly outdated techniques, who will? After going published with my darkest secrets in The Education of Will, it’s feels a lot easier to be honest and straightforward. A few things to add: First, Beth-Who-Sings-to-Her-Dog: You can lead me anywhere and I’ll follow! And to Jonna Connelly, I’m so glad you mentioned V. Hearne. I too loved much of her thoughtful expositions, although I winced every time she described her training methods. I wonder what she thinks now? I, too, love Vicki Hearne’s writing and have read all her books. I read them many years ago and not as training books. I think her book, Bandit, was the first dog book I read as an adult (I had written adult dog book but that didn’t sound right 🙂 She was a poet, professor, scholar, and activist. She introduced me to the idea of dogs as partners and our work together as a contract based on mutual agreement. Her description of how she got one of her dogs to stop digging holes by dancing and exclaiming and having the best-hole-ever-dug party really left an impression. She died in 2001. I now can compare methods and see the difference, but she will always have a very special place in my mind. Dear Dr. McConnell, Thank you so much, for sharing your informed perspective on the latest book from the “monks.” Over the past decade, your insights have been so instrumental in helping me evolve as the guardian of my two beloved pups. Thank you, SO much, for all that you do. you rightly mentioned that the book is #1 in certain Amazon categories. I would humbly ask, Dr. McConnell, would you be willing to review this book on Amazon? There are some 1-star reviews currently, which are helpful… but none as impactful as your review would be. If you reviewed the book in that forum, we (thousands of people following your blog) could all ‘like’ your review/ click that it’s ‘helpful’. Then, a new dog guardian could maybe see your thoughts, and balance them against the many “positive” reviews (arg). all this is to say, if you have the time/inclination to provide a review on Amazon, please know you have a huge herd of dog-loving folks behind you, to ensure your review is seen by those considering this purchase. sorry for the all-caps, but…. folks, PLEASE POST YOUR REVIEW ON AMAZON! Could the kind, thoughtful folks who posted thoughts here, also post their reviews on Amazon? This could help a lot, in terms of sharing alternative approaches with those who plan to buy the book. Education is key, and you could help someone learn of better alternatives. I received a copy of “How to be Your Dog’s Best Friend” when I got my first puppy 15 years ago. As I learned more about dog training over the years and learned shaping, I bitterly regretted the leash pops and corrections I inflicted on her. She was a soft dog who really loved praise and treats, and responded so much better to positive methods when I learned to use them. She remained very unwilling to offer spontaneous behaviors despite much positive training and shaping practice later in her life, and I always wondered if the corrections permanently crushed her willingness to try things. She was a great dog, and I will always regret that I didn’t know better. I’m glad I do know better for my latest dog, a highly sensitive mostly blind and partly deaf border collie. He is far too soft and skittish to handle the monks’ version of leadership. The one thing I liked about ‘How to be Your Dog’s Best Friend’ was that it was written by Job Michael Evans. He wrote two of my all time favorite books: ‘Training and Explaining’ and the ‘Evans Guide for Civilized City Canines.’ I got both when they were brand new so it was a bit more than a couple years ago. He was a wonderful writer and even after all these years I’ll pick one up and read a bit here and there. I believe it’s in ‘Training and Explaining’ where he discusses how he picked books to purchase. Good info. And all that has nothing to do with training. Just dog books I enjoy. Thanks, Trisha, for putting into words what less expressive people, like me, can only feel uneasiness about. I didn’t really understand people’s love of Vicki Hearne – I was too uncomfortable when she described actually working with her dogs: waiting for them to look away to jerk them back to attention and shoving their faces into water-filled holes. Alas, we will never know if she would have changed her techniques because she died in 2001. Jency: Thank you for encouraging people to write reviews on Amazon. From everything I understand, they are extremely important. Interesting observation: When I sent out my blog post there was only one review on Amazon. The next day there were many, all rave reviews of the book and its authors. Most likely (but just speculating) is that the authors or publisher found out about my post and elicited friends to counter what I had said. There’s nothing wrong with that really; publishers tell authors to do all they can to get good reviews. But it does present a biased viewpoint, which is why Amazon now notes which reviews are written by people who actually bought the book. (Although it’s restricted to buying the book on Amazon.) So YES YES YES, please take a moment to write a review–I’m told your star rating still counts whether you’ve purchased the book or not. One last thing: Don’t let this get personal. My objections to the book relate to the methods. I have no doubt that the authors are nice people who love dogs; but that doesn’t mean they are giving dog owners good advice. Yes, I noticed the sudden flood of 5 star reviews on the 27th September, practically all of which mention some sort of personal relationship with the authors, use words like “kind” and “compassionate” in ways that look so similar as to shriek copy/paste, and none of which go into much detail about dogs! I have just liked all the negative reviews – my own review got blocked, probably because I linked to this blog. Tough dog, tough guy image complex with clicker training! Hmmm did I mention being slightly addicted? I freely admit I couldn’t finish the good doctor’s post; too annoying. As annoying as she found the book. The smug self satisfaction of the positiveists is sad. Of course they have some great points, but not an exclusive and they mis a few kty things. But I have the same observation for both the monks and the smug modernists…let me introduce my bulldogs. For the monks, my bulldogs are not looking for a leader; they are the leader. And that’s not negotiable. For the modernists, go ahead, try positive reinforcement. See where it gets you. Smug modernists is a great name for a band. Not sure what it means in this conversation. It is expected that once someone offers an opinion based on experience and data, people who hold an opposing view (even if slight in their opposition) will become defensive. Now whether we respond or act within that defensive emotion or let it pass before we respond is the real crux of the matter. Let’s find our better selves again. Thanks for reviewing, Trisha. How can we mobilize this crowd to place reviews on the proper channels so people get discouraged to buy it? Also, what qualifies these Monks to spread their opinions on training dogs in the first place? However, these kind of posts reflect my concerns that part of the wider problem is we have millions of people happily posting millions of uninformed opinions that will be forever burned into the cybersphere. They are often ferociously posted with a lack of scientific literacy and critical thinking ability. Particularly in the case of Trisha’s experience on Facebook, what concerns me is the devotion that it seems to be OK to electrocute your dog in the name of training because the seductive name of the collar lulls some people into a false sense of security that it doesn’t really hurt, it just stimulates, neglecting or omitting the scientifuc fact behind the learning – of it didn’t hurt it wouldn’t work. So, my view is that the Monks condone abusing and traumatising dogs. The lack of education is something we need to empathise with and try to help as best we can. Because no amount of empirical evidence or data is going to change hearts and minds when people are not even aware of their own biased ways of thinking. As LisaW says, defensiveness often is the default. Please sign it and share this widely because it is a positive action that we can do to try to change hearts and minds to stop abusing animals in the name of training. Excellent review, based on actual science. I, too, have learned a lot over the years. But, I accept that I am the exception rather than the rule when it comes to an owner. I look for reviews such as Dr. McConnell’s to guide me in opening up new paths to follow. I expect that there is much for us to still learn about owning and training dogs. I urge Dr. McConnell and other educated, benevolent leaders to continue to conduct and publish research that will enable us to improve ourselves and our bond with our dogs. Thank you for this review. It’s excellent. It is very sad to me that people like this are still in the dog trainng world and getting books published. I once took the “Monks” to task on their facebook page over one of their books, maybe the last one – I can’t remember. There was a paragraph on how to hurt your dog to make it listen. Maybe it told you how to hit or punch something like that. I asked them politely how they could reconcile their punitive methods with their supposed philosophy as monks and of course their religion. I got a really vague answer that said nothing. I replied that I felt they should be ashamed to call themselves men of God and still espouse this sort of abuse to what they should regard as one of “God’s creatures”. Whenever I see one of their books at my local library I remove it, usually with another abusive dog trainer’s book, and put it somewhere else in the library among the fiction because that’s where it belongs. There is no room in the 21st century for trainers to abuse animals when there is so much science to show that it is cruel and unnecessary and we can train animals without pain or fear. Here is a trainer’s page showing several bulldogs winning many different obedience titles. I had read a book on puppy training a while ago by the Monks of New Skete, and had really liked that one. Haven’t read this one yet, but I was disappointed because it doesn’t sound like it’s all that great! I have been training dogs for over 25 years. What works for one dog does not work for another. It is the same as raising children. Also, a dog training method that works for one person does not work for another. E collars work. Treats work. All positive reinforcement works. Leash pops work. I spend my days rehabilitating dogs that have been trained with “all positive reinforcement” and are dominant and aggressive because their trainer would not dream of helping their family get control of their dominant dog with anything other than treats!!!! This is just silly. To be an effective trainer you need to help the individual dog and owner with what training methods work for their situation. Stop judging and start listening and training. I sent my 5 month old doberman,Zeus, to Marc for 3 weeks of training. Zeus was a perfectly normal 5 month old dog, exhibiting normal behaviours, like counter surfing, jumping up on people, mouthing my kids when he was playing with them and didnt have great leash manners, but he was awesome off leash. Nothing major, I was just trying to get ahead of the 6 month behavioural issues. I paid $3800US upfront. I thought Marc was “force free” because that’s what he calls himself and there was nothing in his book about training with ecollars and pinch collars. When I arrived he pulled out an electronic collar. I was completely surprised. I said “nothing on your website or in your book says you use an electronic collar”, to which he replied “it’s all over my website and my book is not about that”. Up to this point I had only used positive reinforcement on Zeus. Marc and I discussed it and decided he would not use the collar on my dog. He said “I’ve been doing this for 30 years, I can do it without the ecollar.” It still left me feeling uneasy that he had so obviously mislead me. -he attacked 2 dogs in the first 2 days, unprovoked. One was his good buddy. When I asked Marc about this he said “clearly you did not follow protocol”. Meanwhile, Patrick Ferrel, the trainer who trained us said it was fine for him to play with other dogs. -before he went to training, he loved all strangers and new people. In the first week back, he would randomly bark and growl at strangers. -he looked like a different dog. He smelt so bad. We took him straight to Petsmart to have him washed before our 9 hour car ride home. But we could get the smell out for 3 days. His fur had totally lost it’s shine. -before he went for training, he happily went in his crate. After he came back he would completely freakout in his crate, barking and pawing. – and here is my biggest reason to suspect he neglected my dog by leaving him in the crate for inhumane amounts of time…when I came for my two day training on day 1, I mistakenly arrived 2 hours early. Marc was out of town and I was to meet with his partner Patrick, who I assumed lived on the premise. When I contacted Patrick, he was not planning to come until noon. So when was someone last with Zeus if Marc had left town 2 days before?? To which he has NEVER replied. That was 8 days ago. So after $3800, I received my dog back with way bigger issues than when I dropped him off. Any leash manners he was taught were completely gone within 2 days.